The Golden Dragon Acrobats represent the best of a time honored tradition that began more than twenty-five centuries ago. The Golden Dragons are recognized throughout the United States and abroad as the premiere Chinese acrobatic touring company of today. “This unique cirque spectacular showcases traditional Chinese acrobats who dazzle with amazing feats of athleticism, daring heart-stopping stunts and the grace of their centuries-old art form.” ~Broadway World. Danny Chang and his Golden Dragon Acrobats continue their rigorous, 30+ year US touring schedule of a centuries-old Chinese art form, presenting over 200 performances annually. The Golden Dragon Acrobats hail from Cangzhou, Hebei province, in the People’s Republic of China and have toured the United States continuously since 1978. Its members are athletes, actors and artists who have studied and trained for their craft since early childhood. 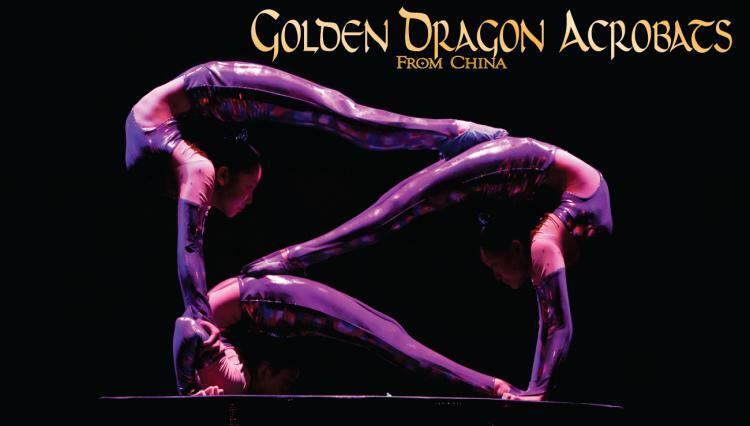 Throughout the history of the Golden Dragon Acrobats, the company has performed in all fifty states, including return engagements in the lower 48 and in over 65 countries across the world. The troupe has distinguished itself from the majority of Chinese acrobatic companies touring this country, by emphasizing cultural exchange; the troupe spends more than one third of its tour participating in community and youth outreach programming. In 2005, their Broadway debut at the New Victory Theater earned two New York Drama Desk Awards nominations (Angela Chang for Best Choreography and Danny Chang for Most Unique Theatrical Experience). The troupe returned to the New Victory for the 2014 holiday season, making them the only acrobatic troupe from China chosen to perform twice at this prestigious venue! The troupe’s reputation remains solidly rooted in a commitment to the highest of production values and an attention to artistic details that is unparalleled in the art form… award-winning acrobatics, traditional dance, spectacular costumes, ancient and contemporary music and theatrical techniques… to present a show of breathtaking skill and spellbinding beauty. The Golden Dragon Acrobats is a wonderful show for all ages.